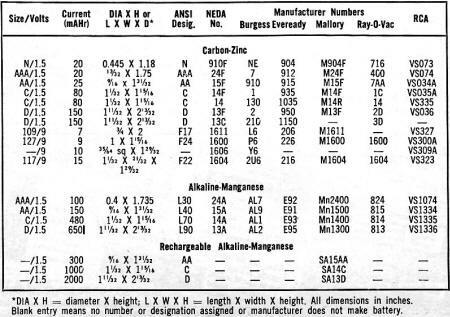 Evidently in 1973 there were only about 400 different battery types to choose from when deciding what to buy for your automobile, electronic device, uninterruptible power supply, flashlight, etc. I don't know what the number of types is today, but the number must be in the thousands. Nominal voltage, case size and shape, energy capacity (amp-hour rating), current delivery capacity ("C" rating), environmental accommodation, connection type (contact, solder, screw-on, or push-on terminals), chemistry, number of recharge cycles (for secondary batteries), and a host of other choices are available nowadays. Every time I need to order a new Li-Po battery pack for a model airplane or helicopter, I spend quite a bit of time searching through mAh versus weight and physical size specifications to identify the best - and most affordable - option. What's That Battery Number the Same As? A certain amount of confusion exists with regard to battery types and numbers. 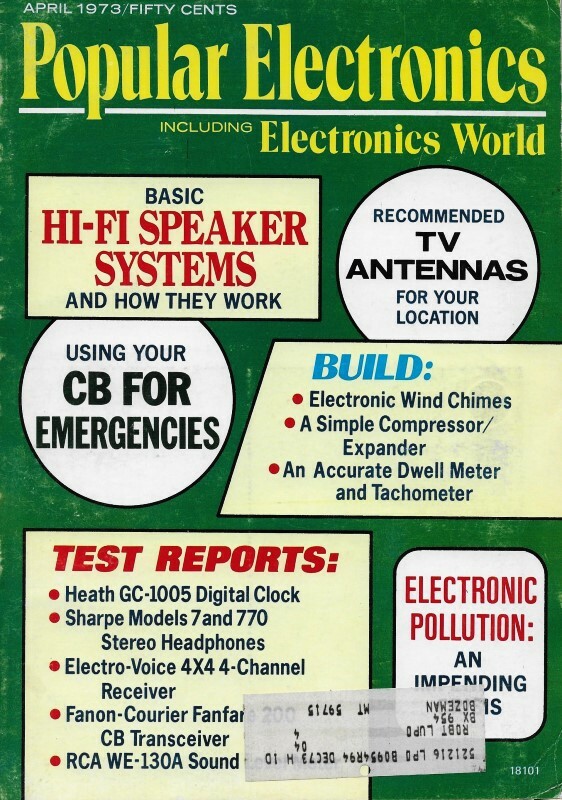 Consequently, it is handy to have a chart that gives the specifications of the various batteries commonly used in such consumer equipment as transistor radios, toys, clocks, etc. Our table is limited to listings for 1.5- and 9-volt batteries. Since there are more than 400 battery types and thousands of manufacturers' numbers from which to choose, we make no pretense that the table is complete. However, the listings should cover most needs. You will note that the batteries are divided into carbon-zinc, alkaline-manganese, and rechargeable alkaline-manganese types. They are listed in the order of their current delivery capabilities from least to greatest. Too, each common battery type is supplied with such statistics as: size, American National Standards Institute (ANSI) and National Electronic Distributors Association (NEDA) numbers, etc. In general, batteries of the same physical size and shape with the same voltage output and terminations can be substituted for each other so long as the maximum currents drawn by the circuits can be accommodated by the substitutes. So, you can put an alkaline type in place of a zinc-carbon battery, and a rechargeable alkaline in place of a regular alkaline battery. It is interesting to note that the current delivery of the more recent alkaline batteries is several times greater than the older carbon-zinc batteries. True, the initial cost of the newer batteries is much greater, but they do not need to be replaced nearly as often as carbon-zinc cells, and if the alkalines are rechargeable types (with higher prices than the regular type alkalines), they can be renewed several dozen times before replacement is needed. Upon perusing our table, you will note that many categories of batteries are not listed. These include nickel-cadmium, mercuric-oxide, silver-oxide, and lead-acid types. 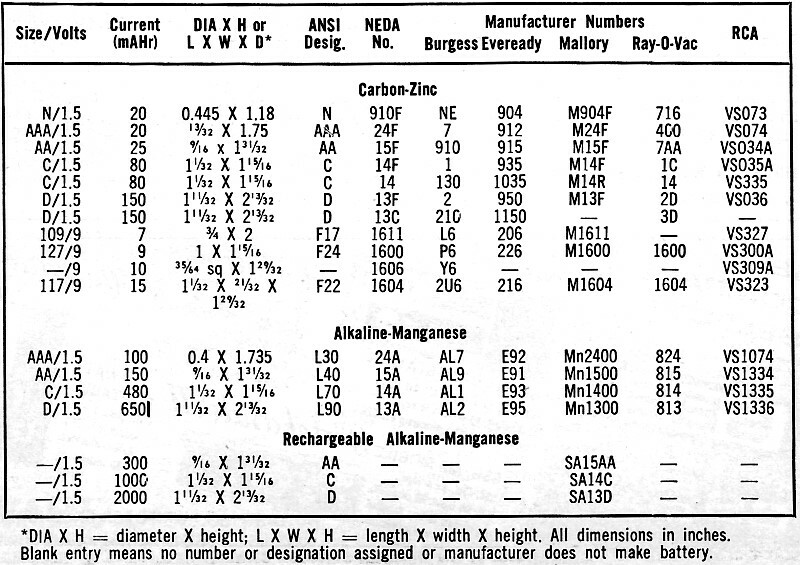 These have not been included in the listing because of their much higher costs and the future likelihood of losing out, at least to some degree, to the rechargeable alkaline types. *DIA X H = diameter X height; L X W X H = length X width X height. All dimensions in inches. Blank entry means no number or designation assigned or manufacturer does not make battery. We will not go into the subject of recharging batteries here since this topic has been amply covered in other articles. But you should bear in mind the following facts that apply to all types of batteries: First, do not allow batteries to run completely down; test them often under adequate loads. Second, do not attempt to recharge a "leaky" or "rusted" battery; the electrolyte is corrosive and will ruin charger contacts. And, third, do not recharge batteries at abnormally high currents; the batteries will heat up and may explode. Testing a battery requires a resistive load that reflects the allowable battery discharge current and an accurate dc voltmeter. To illustrate, a Burgess No. 2 or Eveready No. 950 battery can accommodate a 150-mA load across its 1.5-volt poles. By using Ohm's Law (R = E/I) you can determine that the proper test load for these batteries would be 10 ohms (1.5/0.15 = 10). The resistor selected for the test can be rated at 1/2 watt. To make the test, place the load resistor across the battery's terminals or poles and connect the meter's leads, in proper polarity, across the resistor. The meter will then indicate between 1.5 and 0.9 volts if the battery's charge has not been irretrievably depleted. If you obtain a meter indication of less than 0.9 volt, discard the battery and replace it with a new unit. Batteries should be recharged or replaced long before they are completely exhausted. It is not harmful to recharge a 1.5-volt cell before its charge drops to 0.9 volt. In fact, it is beneficial in that it provides longer total life from the battery.